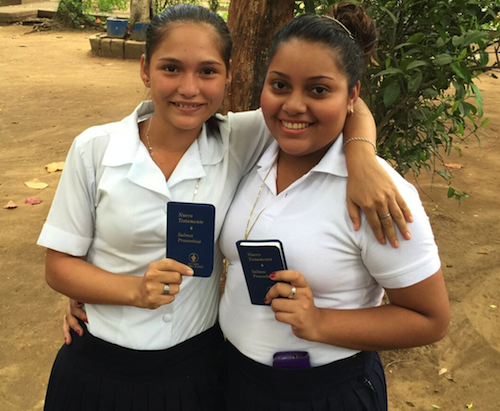 At one public school in Chinandega, Gideons were distributing Scriptures to students in classrooms when the students were adjourned for recess. Gideons stood outside on the school grounds waiting for recess to end so they could continue with distributions. During this time, two students named Joceyln and Vera approached several of the Gideons. The girls began to ask about the New Testaments. The Gideons responded to their questions as the girls listened closely. By this time, four boys approached and were standing behind the girls to see what they were talking to the Gideons about. The presence of these classmates seemed to distract the girls. The girls then turned around and looked at the boys, perhaps to see how these classmates might respond to what was happening. As the Gideons led them in prayer, the two girls bowed their heads and asked Jesus to enter their hearts. We praise God for this testimony. Please pray Jocelyn and Vera will continue to grow in their faith and that their testimony will be an inspiration to believers and non-believers alike. Praise God! Two lost precious souls snatched from hell. Thank you Gideons! Yahve de los Ejercitos !!! Praise God!!! May God give to them faith growing everyday! I AM GLAD THAT THEY RPENTED AND HAVE ACCEPTED JESUS CHRIST AS THEIR LORD MAY THE LORD BLESS THEIR SOUL.